Triss is a simple screen saver that draws a triangle and bounces it around the screen. 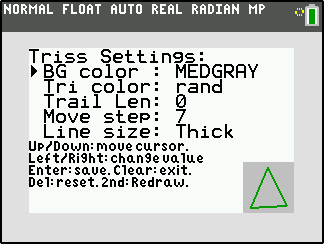 You can control the background color, triangle color, and the trail length. Press 2nd to enter the settings menu. Follow the onscreen instructions to change the values. Press any other key to exit. That's awesome, Shaun! It reminds me of that old Windows (XP?) screensaver that looked rather similar. As you mentioned on IRC, I think the settings screen is particularly well-made. I apologize for the few jsTIfied screenshot glitches that showed up there, by the way. I'll try to track them down. Work merthsoft! Looks good and yes reminds me of the windows screensaver . TIFreak8x would be very unhappy about that last tidbit, I can assure you. You'd better refactor your code into While and Repeat loops before he comes to your house and yells at you. Anyway, did you take this project as far as you wanted to as a quick little project, or is there somewhere else you want to go with it? Heh, I think he'd be okay with it; it's a smart use of them, I think. As for more, I might add another setting for step and maybe the random color option, but that's about it. You can now choose random for triangle color, as well as adjust the thickness of the line and the step of the triangle as it moves. That looks great, merthsoft; thanks for sharing. I hope you get to put that nifty settings menu format of yours to work in a few other programs and games for this calculator (and perhaps a few more for the Prizm again too). There are 158 users online: 2 members and 156 guests. © Copyright 2000-2019 Cemetech & Christopher Mitchell :: Page Execution Time: 0.148196 seconds.